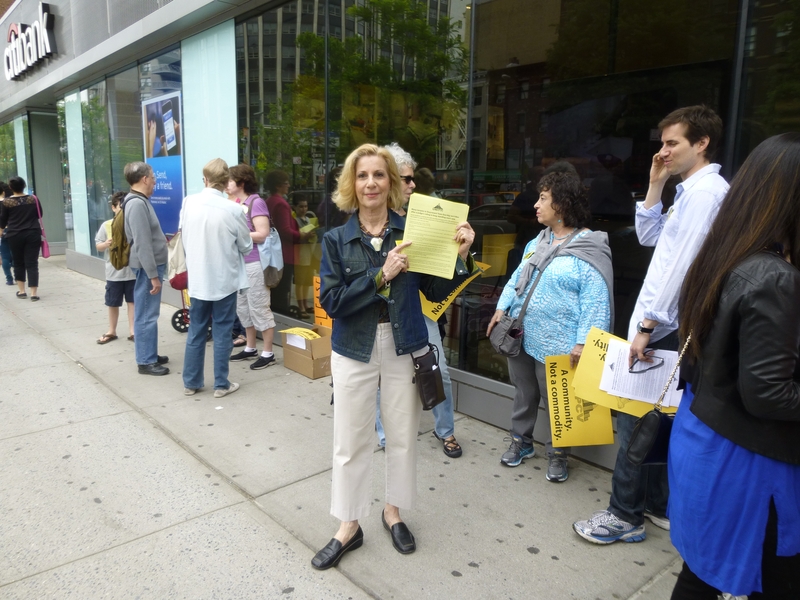 Susan Steinberg, chair of the ST-PCV Tenants Association, pictured at a protest against mid-lease rent increases in May, said the Tenants Association will soon hold a meeting on the latest MCIs. While not quite the chaos caused by Hurricane Sandy a year ago, Stuyvesant Town and Peter Cooper Village are being flooded again, this time with five MCIs for work on the property done by former owner Tishman Speyer in 2009. Earlier in the month, tenants in Stuyvesant Town learned they’d gotten an MCI (major capital improvement) for video intercoms, followed by an MCI issued to residents of Peter Cooper, which was also for security upgrades, including a command center. Tenants learned about the latest round on Friday and over the weekend, via notices that the state housing agency, the Division of Housing and Community Renewal (DHCR) of New York State Homes and Community Renewal (HCR) had approved MCIs for work on three more projects: water valves, doors and resurfacing. Which MCIs tenants got depended on if they live in Peter Cooper or Stuyvesant Town. As far as the Tenants Association is aware, an MCI for water tanks and valves is for PCV residents only; while only Stuyvesant Town residents have gotten MCIs for resurfacing that were combined with charges for doors and water tanks/valves. “We tenants are under siege,” the Tenants Association said in an email to residents sent on Sunday, which included a notice that a meeting would be scheduled soon to answer questions on the charges, which are added permanently to tenants’ base rent, along with a retroactive portion. Costs vary with each building and with each apartment, based on how many rooms there are. Susan Steinberg, chair of the Tenants Association, noted how in the case of one Peter Cooper one-bedroom apartment, the MCI for water tanks, which has a cost of $2.77 per room, the retroactive portion is $407.19. Her own recently issued MCI, being for a one-bedroom in Stuyvesant Town, which includes water tanks, resurfacing and doors, will cost a total of about $25 a month while the retroactive portion is $1,199.52. Like the previously issued MCIs, the Tenants Association is planning to challenge the ones for water valves, doors and resurfacing, based on the fact that in its decisions, the HCR didn’t respond to arguments against them presented to the agency by the Tenants Association’s attorney last year, and possibly other reasons. The Tenants Association said, via email, that it was already in the process of filing what is known as a request for reconsideration, since it believes the housing agency made a “vital (but reversible) administrative error by not considering or acknowledging our 2012 objections to all outstanding MCIs. The approvals, therefore, were issued on an incomplete record.” The association’s attorney, Tim Collins, is also preparing a petition for administrative review (PAR), in case the request for reconsideration fails. The association, therefore, has been requesting that tenants opt not to file their own PARs, though doing so would spare them from having to pay at least the retroactive portion of the MCIs until the matter is resolved by the HCR. Meanwhile, despite the recent communications from the agency, there has not yet been any word on the Tenants Association’s application for a rent reduction based on Sandy-related service losses in 15 PCV buildings and two in Stuyvesant Town. A spokesperson for HCR did not respond to a request for comment on the latest MCIs and has previously said the agency would not comment on its determinations. Steinberg, however, blasted the five most recent MCIs as “a terrible burden” on tenants. The Tenants Association will hold the MCI meeting on Saturday, November 2 from 1-4 p.m. at the auditorium at the Simon Baruch Middle School (MS 104) on East 20th Street between First and Second Avenues. Local elected officials are expected to attend and John Marsh, president of the Tenants Association, said there would be “ample time” for tenants to ask questions, which will be answered by Collins. The association is asking tenants to share their docket numbers and Google documents are available for this purpose through links on the association’s website at stpcvta.org and the group is also soliciting donations to help pay its looming legal bills for the MCI challenges. A spokesperson for CWCapital did not yet respond to a question about whether the MCIs would be reflected in the rent bills for November or December, though Steinberg has said she suspects that since the MCIs came as much as a surprise to CWCapital as they did to tenants, that they would not be charged in the November bills. Note: This article has been updated to include additional information about the ST-PCV Tenants Association meeting.